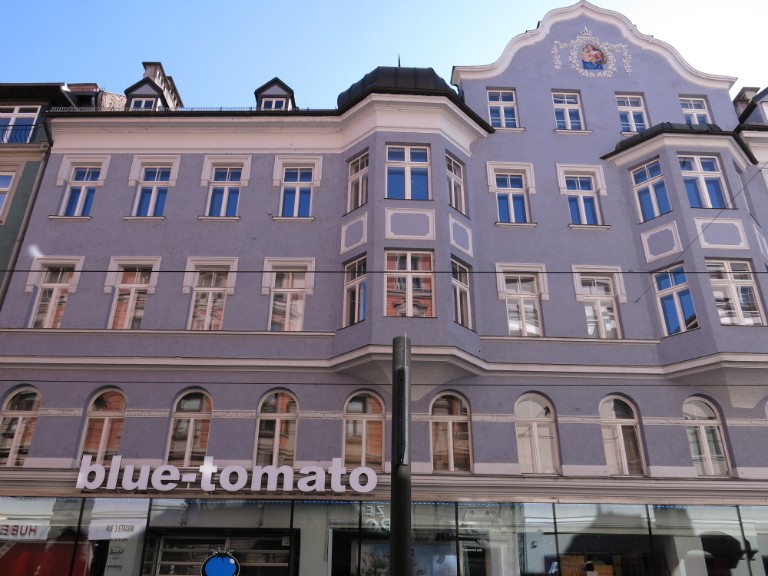 In 1, Anichstraße lived Julius and Emma Pasch, née Schneider together with their six children Hilde, Edith, Janne (Marianne), Hans, Gerda and Ruth, on the third storey of the ‘Zelgerhaus’. 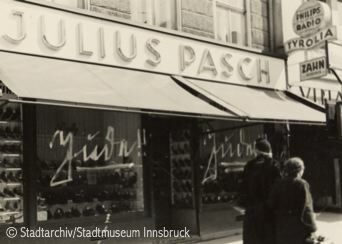 Julius Pasch was President of the Jewish Community prior to 1938 and, together with his wife, ran two shoe stores in Maria-Theresien-Straße, at number 13 and 17–19. 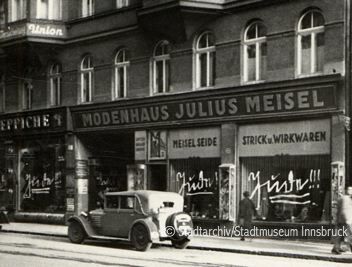 Following the takeover by the NSDAP and the Aryanisation of the shoe shops, on November 1st, 1938 Julius and Emma Pasch and their two youngest children Gerda and Ruth were expelled from their apartment. 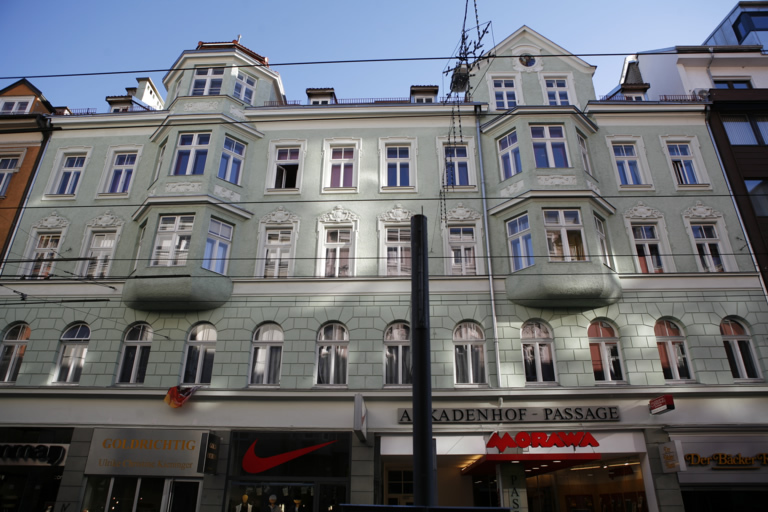 They were quartered in the apartment of Anna Seidl and Adolf Neumann, an old Jewish couple, in 29, Andreas-Hofer-Straße. 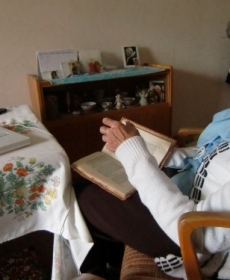 A “gang of thugs” broke into that apartment during the night of the progrom. 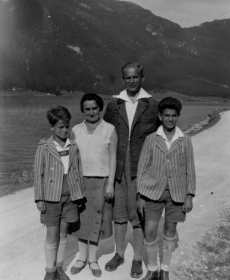 The four eldest siblings (Hilde, Edith, Janne and Hans) had already all left Innsbruck very shortly after the Anschluss. 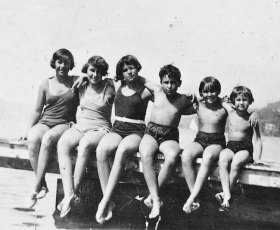 They travelled, often separately, to Italy, France, England, Spain, and Cuba. Hans was interned by the British for 2 years in Austrialia as an ‘enemy alien’. 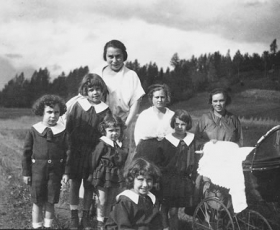 The two younger siblings (Gerda and Ruth) left Innsbruck with their parents at the very end of November 1938. They were sent alone to boarding school in England, later living and working in London and Slough during the Blitz. Julius and Emma travelled via Italy, France and Spain to Cuba. 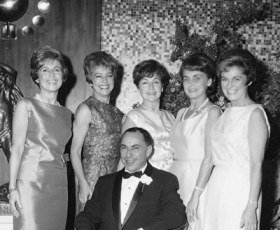 Eventually, Julius and Emma succeeded in bringing all their six adult children to New York. 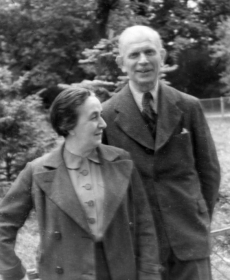 There, Julius died in 1946 and Emma in 1952. 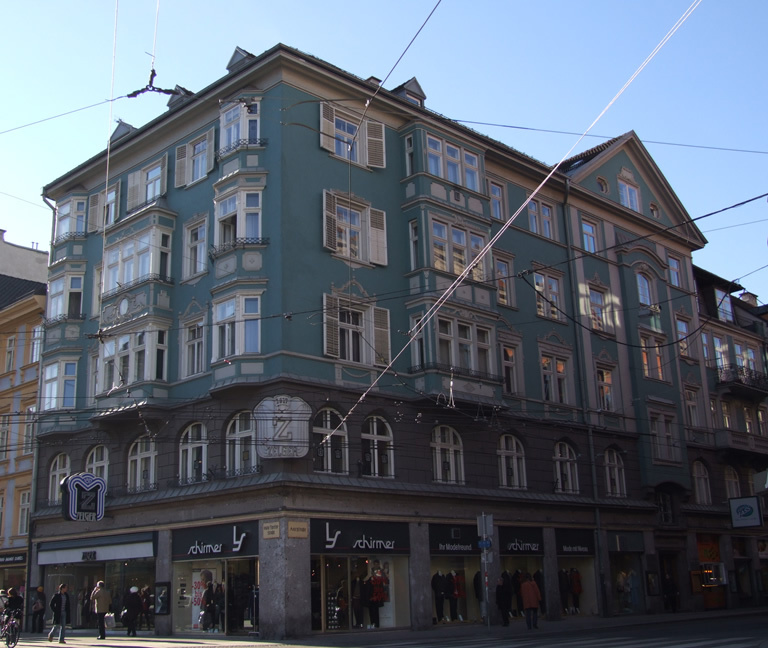 Julius and Rosa Meisel lived together with their nephew Marcel Meisel in 3, Anichstraße. On the pogromnight Julius Meisel was hurt. 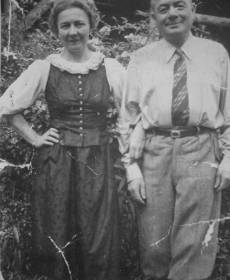 The married couple Meisel was deported 1942 from Vienna to Poland and murdered there. 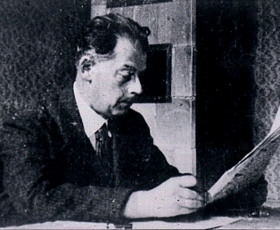 Marcel could emigrate in June 1938 to England. 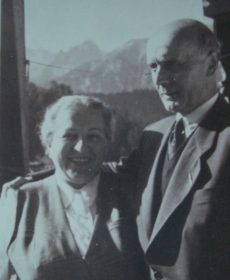 Gertrude, née Weiss and Josef Adler, alderman of the federal railway and brother-in-law of the murdered Richard Berger were assaulted in their apartment in 5, Anichstraße and seriously injured as a result of blows to the head. 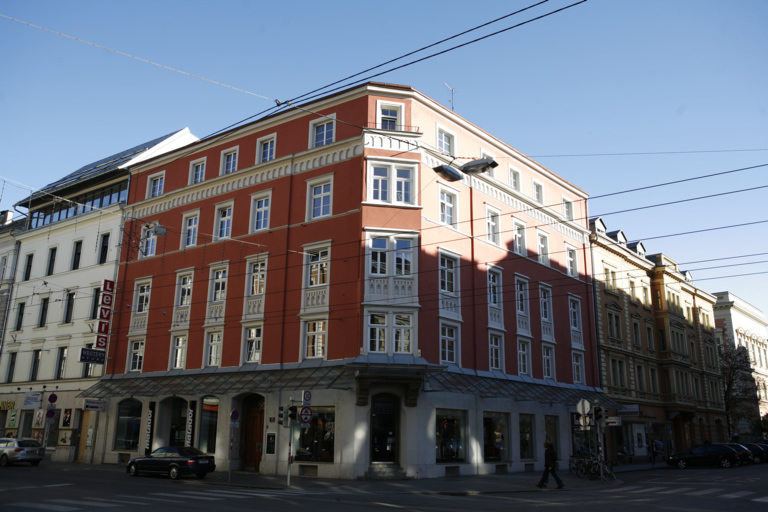 At number 7 there was the furniture shop founded by Michael Brüll and the flats of his children. 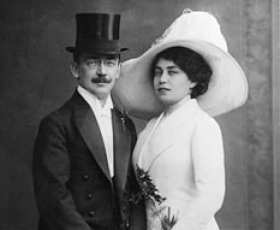 On the pogrom night Rudolf Brüll and his wife Julie, née Steinharter were injured by blows and kicks. 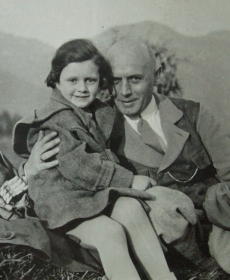 They lived together with their daughter Ilse. 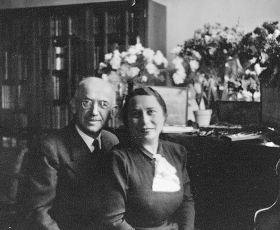 Josef Brüll and his wife Antonie, née Wasserer and their daughter Inge also lived there. Josef was injured by kicks and was arrested by the Gestapo together with his brothers Rudolf and Franz. 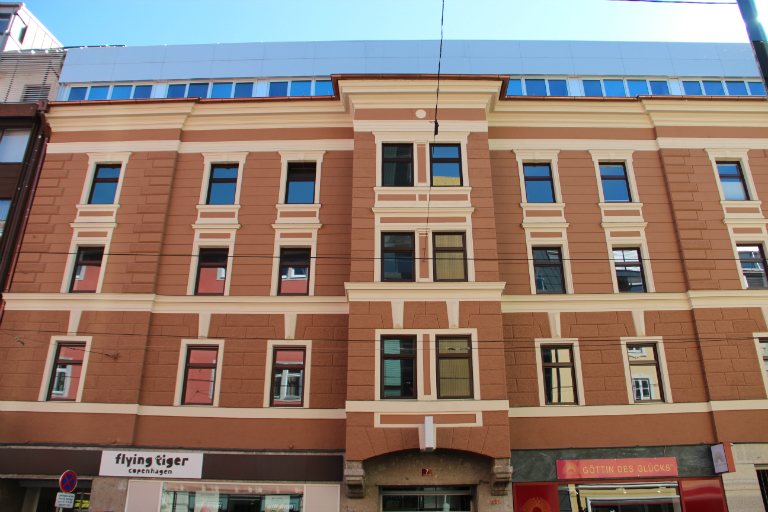 The major part of the families moved to Vienna in January 1939. 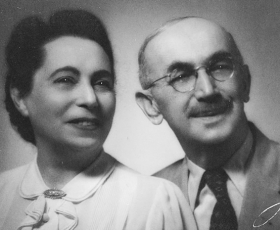 Rudolf and Julie Brüll were captured during their flight and survived the Theresienstadt concentration camp of. 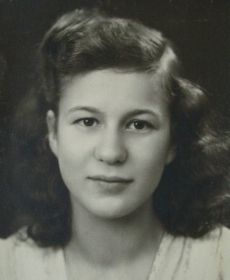 Their daughter Ilse was gassed in Auschwitz in 1942. 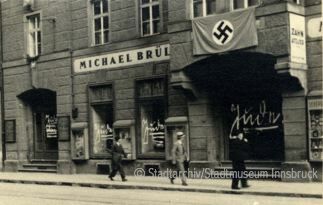 After 1945 they returned to Innsbruck, where Rudolf Brüll had to fight for his furniture shop and remained president of the newly founded Israelite Community until his death. Felix and Franz Brüll also returned from exile. 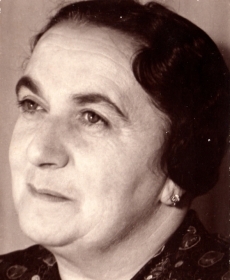 Grete Berger and her son Walter fled to Palestine, while her second son Fritz had already emigrated to England in 1938. 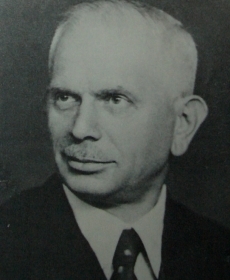 1945 Fritz Berger was involved in the detention of Gerhard Lausegger, one of the main perpetrators in the assassination of his father Richard Berger. Valerie Neal, daughter of Ruth Pasch called my attention to the book “To Remember Me By”, in which her father Ernst Oppenheim published the history of family Emma and Julius Pasch. She generously provided private photos of her family for this project and edited the text. 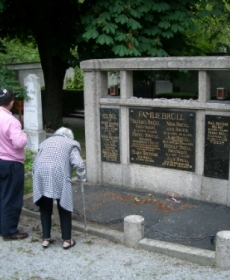 Inge Brüll, daughter of Josef and Antonie, has been fighting for the memory of her cousin Ilse and died on September 7, 2011 in Innsbruck. All private photos showing members of the Brüll family were made available by Inge Brüll, for which I will ever be thankful.